Feeling indimidated ? You don’t have to be ! Investing in loans doesn’t have to be difficult. Alternative Investments is here to guide you through the whole process. If words like p2p lending[? ], crowd-lending[?] or originator[?] still sound a bit mysterious to you, don’t worry ! Our contents will help you get more familiar with this topic. This page aims at introducing it to absolute beginners. We’ll get in much more details in later sections ! Why invest in loans ? Depending on how much risk you want to take, returns of 15% or more are possible. Even a conservative portfolio will yield more than 11% per year ! The principle is very simple : through the platform, an investor lends some money to an individual or a business. The borrower will then pay interests to the investor (usually monthly); at the end of the loan’s duration, the capital will also be reimbursed. The borrower may be either an individual or a business. Each loan is usually split between many investors; this helps spreading the risk between all lenders. For example, the following loan was split between 921 investors. In addition, the firm that emitted the loan (the originator) also invested in the loan; this helps ensure that they will provide quality loans. While the ergonomics will vary from one platform to another, the process of investing in loans itself is usually simple. Nearly all platforms will let you choose your loans manually if you wish too; however, it may be time-consuming, and even tedious if your have a large portfolio and want to diversify it. In this case, it’s possible to use the auto-invest feature; it allows you to select the loans categories that interest you. The system will select the loans automatically based on your choices. Again, this will reduce risk as it’s very easy to spread the invested amount between many loans. The hardest part is deciding how much risk you want to take, or seen the other way, which interest rate you target. When the investor lends money to individuals, the commonly used term is peer-to-peer lending, often abbreviated as P2P lending. On the other hand, if the lent funds are used to finance a real-estate project or a business, the term crowd-lending (or sometimes crowdfunding) is used. The greatest risk when investing in loans is a default from the borrower, that is he/she stops repaying the interests and principal. What happens to your investment in this case depends on the loan characteristics; many offer what is called a buyback guarantee, which means that you will be reimbursed the principal (and sometimes even the interests) after a delay. We’ll cover this important mechanism in a later chapter. However, not all loans come with this guarantee; it usually covers individual loans, but many large platforms for business and real-estate loans don’t offer this feature yet. In this case, you’re likely to suffer a loss in case the borrower defaults. For individual loans, in order to evaluate how risky a loan is, the platform will usually assign it a rating. If the borrower has a low credit rating, the default risk is higher, but the loan will usually yield higher interest rates. 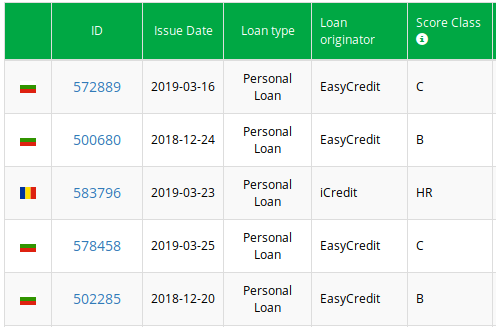 Here’s a loans list showing the assigned risk rating for each loan. It’s also a great idea to look at the platform statistics to help you in your decision, as the rating themselves are rather subjective; the default rate itself for each rating is much more meaningful. Risk for other kinds of loans are trickier to evaluate, so they’re more suited for intermediate and advanced investors. A few platforms provide their own evaluation of the project’s risk, as shown in this screenshot where the project is assigned a rating between A1 (least risky) to C5 (most risky). Also, when investing in real-estate or business loans, it’s critical to look at the platform’s track record and check how many loans are late or defaulted; if defaults happened, prospective investors need to assess how well it was handled by the platform. After this easy introduction to investing in loans, our next article will help you determine your investor’s profile. How do you calculate the XIRR that you use on your website? You can use the following post as a guide to XIRR computation. If something isn’t clear, don’t hesitate to ask ! I advise you to start tracking it as soon as you start investing, because searching the history for past transactions can be tedious with some platforms.